Marigolds are bright and beautifully colored flowers, which can make them a gardening favorite for young children. Whether you are searching for an art project, kitchen venture or an early science lesson, these activities will keep your child happily entertained, teach him something new and provide him with something special to show off to every visitor for weeks to come. Marigolds are an easy flower to grow because they thrive in nearly any type of soil and can withstand a lot of sunshine, which make these flowers perfect for introducing your child to gardening. Help your child develop a love for flowers by planting his own backyard garden of marigolds. Have him dig a few small holes in his new garden, spaced about 12 inches apart. Next, place the baby flower in the hole and cover up the roots with dirt. Water daily and watch the flowers bloom. If the weather is too cold for outdoor planting, you can bring the activity inside and help your youngster start seeds indoors up to six weeks before the last frost of the season. Turn the activity into a lesson in science by recording the growth of the marigolds each day, from seedling to mature flower. Help your child learn about the shape and color of marigolds with a tasty baking activity. Start with your favorite roll-out cookie dough -- sugar cookie dough works well -- and have your child help add ingredients to learn about numbers and measuring. When the dough is ready, roll it out to 1/4-inch thickness together on a surface dusted with flour or confectioner's sugar. Use marigold-shaped cookie cutters to cut flower cookies from the dough and place each cookie on a baking sheet. To give the cookie flowers stems, slide a wooden skewer into each flower and bake until lightly browned. Cool the cookies and then provide your baking enthusiast with bowls full of tasty decorations, like icing and colored sugars, to adorn each cookie. 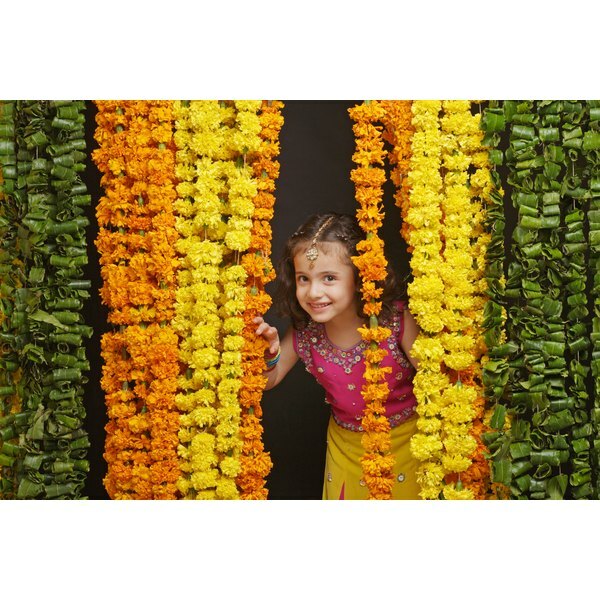 Gather the edible marigolds and tie the skewer stems together with some ribbon to complete the activity. Make a bouquet of tissue paper marigolds that you can display on the kitchen table for years to come. Start by cutting out circles of orange and yellow tissue paper to form the flower heads. Layer 10 to 12 circles together and then make a tiny hole through the center of the pile. Slide a green chenille stick through the hole to make the stem and then make slits all the way around the outer edge of the tissue paper circles to give the flowers individual petals. Make leaves from small triangle shapes of green construction paper and glue each one to the flower's stem. Now the flowers are ready for you to display. This painted garden of marigolds will look beautiful on the kitchen fridge. Fill a bowl with orange paint, one with yellow paint, and then swirl the two colors together gently in a third. Place a piece of painting paper on a newspaper-covered surface. Have your child dip a loofah sponge into one of the paints and then press down on the paper with the sponge to make the first marigold flower head. Repeat to make as many flowers as you like and then fill another shallow bowl with green paint. Hand your little artist a medium-size paintbrush and let her create a stem for each of the loofah sponge flowers. When the painting has dried, you can cut out each individual marigold to display or keep the garden together and display the whole picture on the fridge.